New single-coils and humbuckers were developed in conjunction with guitarists Tim Henson and Scott LePage. DiMarzio has unveiled a trio of new Notorious pickups, developed for Polyphia guitarist Tim Henson. The new models are the Notorious Minibucker Bridge (DP283), Notorious Neck (DP284) and Notorious Middle (DP284S). All three feature gold covers, are made in the U.S.A. and are available now. The Notorious Minibucker Bridge, meanwhile, is designed to have moderate output in order to balance with Henson’s Notorious single coils in the neck and middle. List price for the Notorious Minibucker Bridge is $134.99 (MAP $99.99) and the Notorious Neck and Middle are $129.99 (MAP $89.99) each. 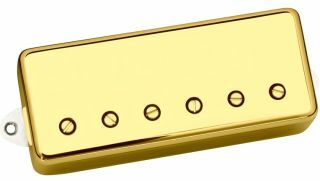 Additionally, DiMarzio has announced the release of the Igno (DP285F) humbucker, developed for Henson’s co-guitarist in Polyphia, Scott LePage. The Igno features Alnico 8 magnets for increased output, as well as DiMarzio’s dual resonance design with both coils scatter-wound to produce a warm response that’s not too high in the mids. The Igno features black bobbins with gold pole pieces, is made in the U.S.A. and is available now. List Price is $129.99 (MAP $89.99). For more information, head over to DiMarzio.com.